See explanations below the chart. When people ignore God's truth, they soon drift back to capricious powers of the occult. But as time passed, power and prosperity led to apathy and compromise. In spite of God’s repeated warnings, many attributed America’s achievements to human intelligence rather than God’s grace. Instead of thanking Him for His blessings, many ignored His Word, rejected His guidelines, and said in their hearts, "I want to go my way... do my own thing!" 2. Humanism. This stage of the downward slide serves as a bridge between Biblical faith and paganism. Turning hearts of the masses from God to self, it blinded people to His saving Truth and opened their mind to deception. By the early 1960s, atheistic leaders were banning prayer and Bible reading from public schools, while humanist leaders persuaded gullible followers that God was a myth and man reigned supreme. But disillusioned seekers soon realized that humanism alone failed to satisfy their dreams. A spiritual vacuum had created fresh hunger for supernatural power. They were ready to try anything -- except true Christianity -- to gain spiritual power." 3. New Age. The New Age movement promised unconditional spiritual power to self-centered seekers. Blending Eastern mysticism, an inflated view of human potential, and a fascination with a mystical "force," it invited gullible seekers to be their own god. Free to experiment with mind-altering techniques and occult formulas, man alone would master his fate." 4. Neo-paganism. "Human administration of the universe is far too great a task.... What we need... is the sensitivity to understand and respond to the psychic energies. This is the ultimate wisdom of tribal peoples," wrote Thomas Berry in The Dream of the Earth, a Sierra Club book instrumental in turning humanists like Norman Lear from atheism to earth-centered spirituality. 5. 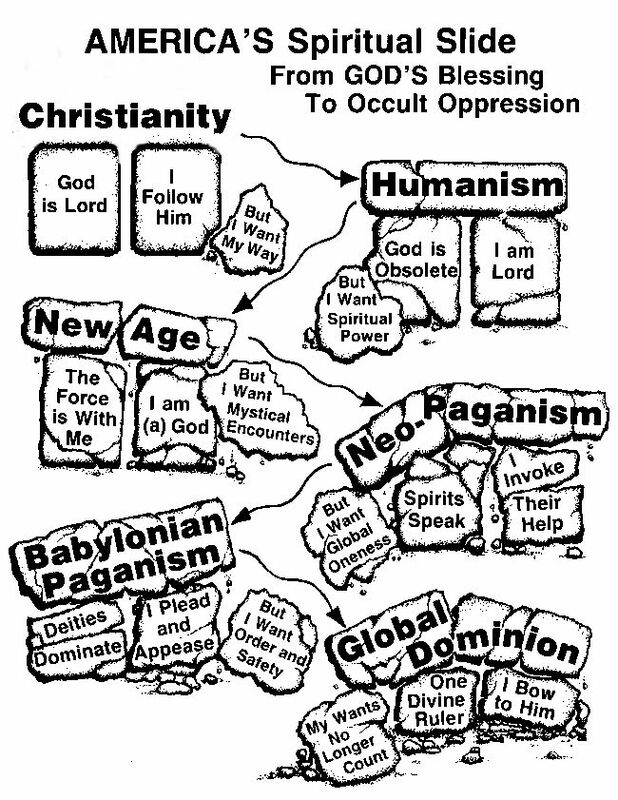 Babylonian paganism. Biblical morality is despised, banned or forgotten. The masses imagine new gods -- or enticing distortions of the true God. As always, this self-focused spirituality implies war on Biblical Christianity. After all, those who are chasing today's rising tide of promiscuity feel nothing but hatred for the old moral guidelines that protected Americans from corruption for almost two centuries. Since the masses are turning their backs to the Biblical God -- demonic spirits are fast gaining acceptance by accommodating human demands. It doesn't take long before their victims are trapped. Meanwhile, the rising hatred for Christian values is silencing superficial Christians -- those who would rather compromise than suffer rejection for Jesus' sake. Those who remain faithful often stand alone -- with Jesus as their best Friend and Shepherd. A rising tide of promiscuity surrounds them, as the spiritual torments, cruelties, and power struggles that have always characterized pagan civilizations are now corrupting America. 6. Global dominion. The Old Testament shows that in times of mass rebellion and idolatry, God withdrew His protection from the land He loved [Numbers 14:9; Mic. 1:11; Isaiah 22:8-9; Deut. 8:6-20, 31:17; Ezra 8:22; 1 Cor. 10:1-11] and allowed enemies to enslave His foolish and rebellious people [Deuteronomy 11 and 28]. Suddenly, the old presumed "rights" to free speech, private property and Christian child-raising are fading away. Only God knows when this last step will become reality, but according to Revelation 13 and 17, it will happen -- after a worldwide revival of Babylonian commerce, corruption and paganism.